CAL is a company limited by guarantee which campaigns to achieve urgently and sustainably full compliance with World Health Organisation guidelines for air quality throughout London and elsewhere. CAL is independent of any government funding, has cross-party support and a large number of supporters, both individuals in London and organisations. CAL provides a channel for both public concern and expert opinion on air pollution in London and elsewhere. This document provides both general and expert comments in response to the Consultation. Please share this response with those preparing the ‘Internal market’ and ‘Transport’ Reports and consider it also in relation to access to environmental justice, industrial and transport emissions and other matters. The review of the balance of competences is a UK Government initiative. For the purposes of this review, the Government is using a broad definition of competence saying “Put simply, competence in this context is about everything deriving from European Union (EU) law that affects what happens in the UK”. In areas of shared competence, such as the internal market, environment and energy, either the EU or the Member States may act, but the Member States may be prevented from acting once the EU has done so. Article 191(2) TFEU also sets out some significant principles which govern EU environmental policy. Where the EU has laid down internal harmonising rules relating to environmental protection, the Member States will no longer have the competence to enter into international agreements affecting those rules. However, where the EU has only laid down minimum standards relating to environmental protection, Member States retain the power to enter into international agreements establishing other standards provided that these are not incompatible with the EU ones. In summary, existing EU law is based on fundamental principles that the right of access to the internal market – free movement of goods and service – comes with responsibilities to protect and improve the environment and public health. Further, as Defra and DECC acknowledge, air pollution has common sources and impacts across the EU. Only the EU has competence to set Europe-wide product standards and environmental limits. The free movement of goods and services requires the standardisation of products to deliver economies of scale and benefits to citizens. Scientifically based health and environmental limits, backed by deadlines and enforcement, protect the public and the environment and underpin and drive innovation and efficiency. Free markets without product standards and environmental limits would be inefficient, increase inequalities and lead to anarchy. Rights must be matched by responsibilities. The Environment and Climate Change Report (the Report) highlights emission reductions since 1970 (page 18) but fails to highlight that the ‘known’ health effects of air pollution have risen much faster than air pollution has reduced (or changed from visible coal smoke to invisible diesel exhaust particles). In a sense, in health terms, we are back where we ‘thought’ we were 60 years ago with air pollution [still] the biggest public health risk after smoking. Please see CAL’s guide (Exhibit 1). Please also reference the World Health Organisation classifying diesel exhaust as carcinogenic for humans in June 2012 (Exhibit 2). Exhibit 6 shows that the World Health Organisation’s Non-Communicable Diseases model excludes environmental exposures other than tobacco smoke. Please see also a benefits slide showing air pollution in the context of other public health risks (Exhibit 7). The Environment and Climate Report explicitly and implicitly makes much of alleged failures of EU engine emission standards. Contrary to the Government’s claims, an investigation by CAL shows failures by successive Governments have dwarfed any by European engine emission standards. Ignoring 10 years of warnings, Governments are responsible for more than doubling primary NO2 emissions from diesel vehicles – even after allowing for the increase in NO2 emissions as a percentage of NOx emissions from around 5% to over 20%. 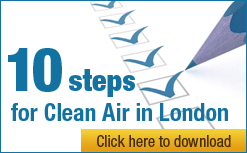 London has the highest levels of nitrogen dioxide (NO2) of any capital city in Europe. See CAL’s investigation dated 1 June 2013 (Exhibit 13). 75% of UK respondents think that the EU should propose additional measures to address air quality problems. Only 16% of UK respondents said this is not EU competence. The EU is more trusted to protect the environment and public health than the UK Government. CAL points the Review team to numerous reports by the European Environment Agency into need for and success of air pollution policies. Please contact me if you wish to discuss any of this evidence.